Panhead replied to Panhead's topic in Cigars Discussion Forum "the water hole"
I would have dissect them but I didn’t waste my time and gave them away. I also emailed the people that I got it from but got no response to my situation. Also , the bottom of the box lettering was not indented like normal Cubans. Just inked on. Thats why I thought It was odd. Yea the black market has alot of its downs. However as crazy as cuba is I have never not had a box without the Habanos paper and The bottom of the box let during recess. However, after finding FOH there is no reason to buy anywhere else. This community is great bunch of people and the cigars are the best. Panhead posted a topic in Cigars Discussion Forum "the water hole"
Have the counterfeiters up their game ? If this is not appropriate please delete I apologize. I purchase this box of RYJ wide Churchill last year. I can tell you that it wasn’t from our community or FOH. You guys now your sh!! so I thought this would be a great place to seek wisdom. With attached photos you will see the outside box the scratched off barcodes. The odd bottom of the box. And finally no cedar or Habanos paper inside of the box . The wood grain dose not look normal and the lettering is larger than normal. The lettering is not and burned into the wood. So my thought is, are they taking the bottoms out of a real box and switching out the reals for fakes and replacing with look alikes ? No pics of cigars I smoked them and gave some to friends. If this is true I hope this will help the people that order their cigars online. First I wanna thank all of you for your time and input. I was really lost at to get with my budget. What I mean about a lasting long is a stick that will smoke for 1.25 hours. Unfortunately, I cant buy and age cigars due to me unable to work. I cant buy one or two CC for the weekend. It takes me months to save up for a box. I do smoke NC but would not waste money on a box. Therefore, I smoke what I buy. With all these suggestions helped me narrowed down which brand/ size and helped me immensely. I appreciate all of your suggestions. I would have never thought of some of these suggestions. Im glad that I asked. I would have most likely made a bad decision. Ill get back with my decision. Thanks again y’all My source is FOH, so thats where ill be getting them. Ill keep my eye on 24:24 but you guys are so fast I don't have a chance. Thanks all again. I lowered the humidity. lesson learned . I had my first Ramon Allones SPECIALLY SELECTED and had a serious bad burn issue. 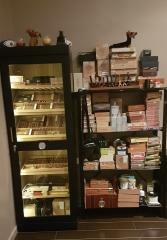 I keep my humidor between 65/70% humidity. Are these cigars known to have burn issues or is this my doing? Any help would be appreciated. Hello y’all !! My name is Jake. I’m New to this forum however, I have been watching FOH on YouTube for years. Love the Springsteen Ken has playing in the background:) Kens the man. My forever home is in New Jersey. Once The taxes got out of control, my wife and I moved to Bushkill PA . After ten long years of more winter than summer, we packed our bags and headed down to Charleston, South Carolina.